Product Reviews, Restaurant Reviews and Recipes: All GLUTEN FREE! FreeFrom Food Awards 2019: SHORTLISTED Finalists Announced (With Manufacturer LINKS)…. After the extensive restoration of St Pancras Station, which got investment and focus when it was decided that Eurostar (trains to Continental Europe) moved there. The Midland Grand Hotel was a masterpiece of the great Victorian Architect George Hilbert Scott (who has also left us the Albert Memorial,, the Foreign and Commonwealth Office, St Mary’s Cathedral in Glasgow amongst his ever-lasting legacy. It was left in ruins as part of the British Rail empire. It is now part of the Marriott chain with a magnificent frontage on the Euston Road and a tranquil paradise away from the tracks, train announcements and hustle of passengers. This grand dining room is now under the direction of Marcus Wareing, a protege of Gordon Ramsay offers Great British dishes which are heavily influenced by British heritage. A relaxed lunch, although I was worried when I made the reservation that we might have to vacate the table as they state that you have the table for 2 hours (as a pair) but in the end we sat there for nearly 3 hours and no-one pushed us out. My Main course of Cumbrian Pork Chops was delicious. The Chop was cooked well with no pink but enough softness that some of the meat melted in your mouth. The fat added to the flavour and it was served a top a Parsnip Mash which was very sweet, a Cranberry Jus and of course some greens (Brussels Sprout tops). The Chop was a large one and I struggled to finish this whole course but thoroughly enjoyed the traditional nature of the dish. And finally, my dessert was all Gluten Free so no changes needed to be made. It consisted of a Dark Chocolate Cremeux which had a dark chocolate depth to it and a mouse creamy texture. The clementine sorbet was sweet and a good hit of citrus without being too sweet and orangey and the pistachio praline added a crunch to the dish. It was a variation on a Chocolate Orange and a lovely way to finish my long GLUTEN FREE lunch. It was a very nice relaxed Lunch with a good selection of dishes which were GLUTEN FREE. All were presented very well and had simple flavours and tasted beautiful. Other Chain restaurants reviewed on my blog includes: Chef & Brewer Pub: The Bulls Head, Ed’s Diner (which I love because of their Cheesy Fries), Honest Burgers (with GLUTEN FREE Onion Rings!) and Pizza Express (including their new GLUTEN FREE Dough Balls). If you “Like” my Facebook page you will automatically receive new posts into your Facebook Newsfeed. If you are a member of Coeliac UK, they produce a comprehensive directory which covers over 16,000 food and drink items (including GLUTEN FREE Chocolate Bars). This is available in a paper-based Manual and online FREE to members of Coeliac UK. Our charity are working with many restaurants and once Coeliac UK are satisfied, they are accredited by Coeliac UK: Click Here. Accredited Restaurants reviewed on my blog includes Carluccios, La Tasca and Ed’s Diner. One of the hard-hitting posters (featuring Yours Truly) from Coeliac UK launched for Awareness Week in 2015 and featured in the Netherlands in 2016. SIGN UP so you do not miss out on future updates to the Chocolate Bar listing, Chocolate Bags and Boxes, as well as new Restaurant Reviews, Travelling experiences, Food Shows, Product Reviews and (occasional) Recipes. Also check out my posts on GLUTEN FREE Ice Cream, GLUTEN FREE Advent Calendars, GLUTEN FREE Mince Pies and GLUTEN FREE Valentines Treats. This information was correct as of February 2017. But as I am learning, ingredients do change and therefore you should always read the label and check for yourself whether it is GLUTEN FREE or not! This entry was posted on February 24, 2017 by glutenfreepsd in News & Views, Photographs, Restaurant Reviews and tagged food allergies, gluten free bread, Gluten Free Gilbert Scott, Gluten Free London, Gluten Free Luxury, St Pancras. 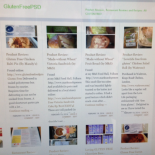 Enter your email address to follow GlutenFree PSD and receive notifications of all my new posts by email.